Fifteen days total but halfway through I began to lose myself to the constant and extreme pain. My medication cocktail sometimes caused me to see dragons and aliens. I'd been in intensive care for the bilateral pulmonary embolism and life threatening blood clots. I was about to begin a chapter of life I'll never forget, one that has left physical scars and emotional pain. 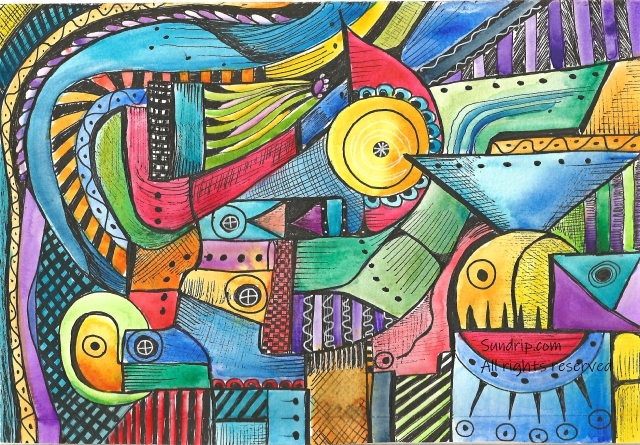 What I've decided to do is express some of those experiences through art. The first experience in multi media is called Three Birds. Half way through ICU care I was losing it. The doctors worried I'd have to go on dialysis. My kidneys were shutting down, my heart was in trouble too. I was in trouble and I knew it so I asked my God, "Are you with me?" I needed to know if He knew his servant needed his comfort and approval. ...continue reading "Three Birds"
You have so much love to give, that’s what makes you special. Author FaithPublished on October 27, 2017 October 29, 2017 Leave a comment on You have so much love to give, that’s what makes you special. I have a little one who was born in a small division of Indiana called Rosedale Hills. She was born in a home where art, music, love and laughter fill the rooms. The scent of joy is roses. The feel of care is as smooth as cream as its poured into what will become sweet ice cream. It is a home of peace with an environment conducive to growth. 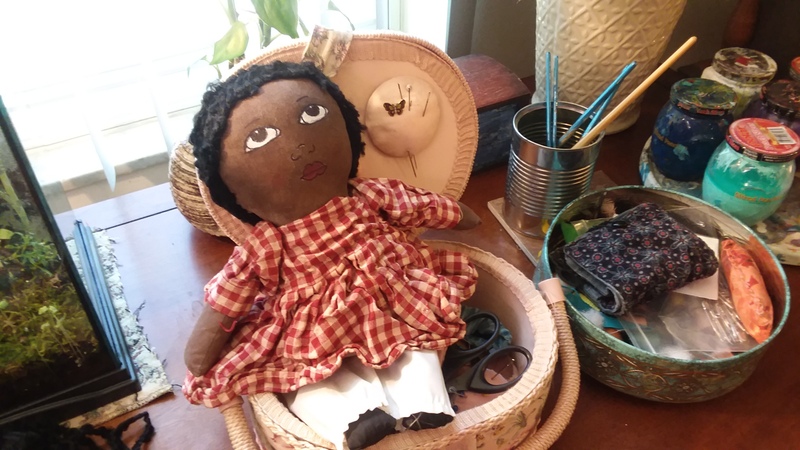 This is Rose Marie, a hand stitched, hand painted, African-American ornamental rag doll. She's about 12 inches from head to toe and wears little white undies and little black shoes. I know what you're thinking. I've seen her before. She sold last week. Only part of this is accurate. Let me explain. Rose Marie was born here at Sundrip in Rosedale Hills and was ready for her new home. Her bags were packed and her heart was set for the road ahead but there was a snag in her adoption so she sits very sad, on my lap, holding my hand. Rose Marie: Why not me? 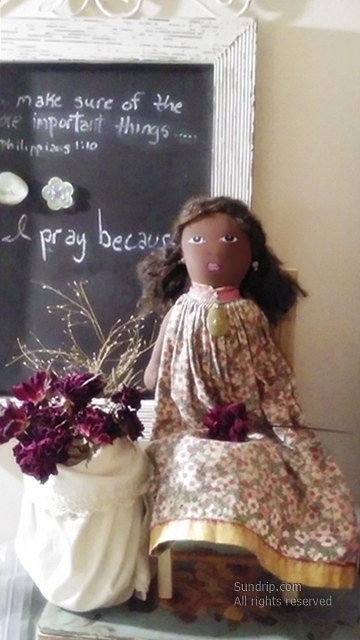 Faith, doll maker: It's not you sweetie. It's just that life got in the way and she wasn't able to adopt you. Her circumstances changed. It's not you. Rose Marie: The other girls got adopted, she said. Faith: I know. Those circumstances were different. The two mothers who adopted them had all their ducks in a row, they were ready and sure but the person who was to adopt you wasn't able to get her ducks lined up. It was her ducks out of quack, not a flaw in you. You're perfect. You're perfect with those beautiful, soulful eyes. You're beautiful with your soft hair and smooth brown skin. Little one, you are beautiful in your dress with gold trim and the handmade pendant around your adorned dress. There is no flaw in you, no flaw. Rose Marie: Will someone else adopt me? 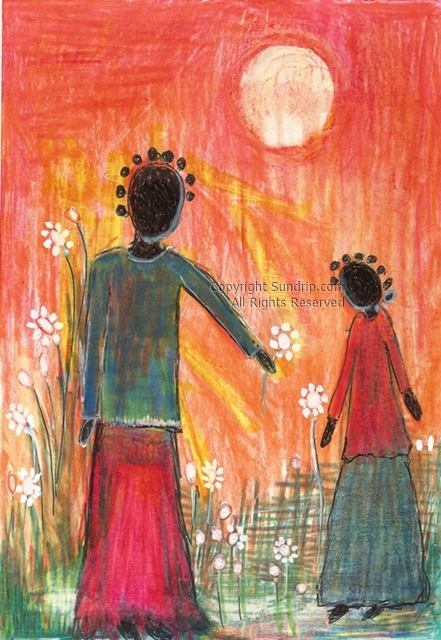 Faith: As sure as the sun rises, you will be adopted. Rose Marie: Will they have problem ducks too that don't like to line up right? Faith: Next time we will be much more careful about people with rebel, lunatic ducks. We'll make curtain the arrangement is more secure so that you don't get your hopes up or have your heart broken. Rose Marie laid her head on my chest, squeezed my hand and said, "I didn't mean to make it sound like I don't like living with you." Oh honey, I know. It's just that you want a home of your own. You deserve it and it'll happen. It may not be today, it may not be tomorrow, but it'll happen. And so Marie wrapped her plush arms around my neck and squeezed tight. "I love you very much" she said. "I know baby doll. You have so much love to give, that's what makes you special." Moral of the story. 1) Ducks can be thugs and rebels. 2) One must be patient for their heart's desire to be filled. Rose Marie is up for adoption. She likes long naps, a good book, hugs and holding hands. At this time she's in hug therapy and being treated for Post Traumatic Duck Disorder. She's progressing but would prefer a home with no ducks. 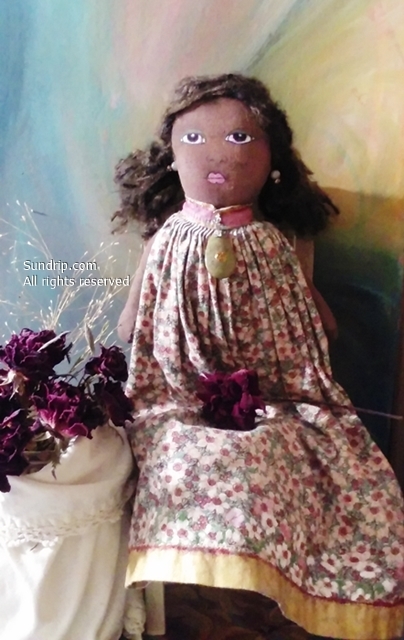 You may purchase Rose Marie the ornamental doll for the administrative fee of $29.00. This covers shipping to the United States. International shipping varies. I refund all international shipping over $1.00. Please contact me at SundripJournals@gmail.com to adopt little Rose Marie. Please don't send money until we have confirmed that Rosie is still available. I accept PayPal and will soon place her in Etsy. They have their own administrative fees so there will be a slight increase when purchasing from Etsy. It is best and secure to use PayPal. 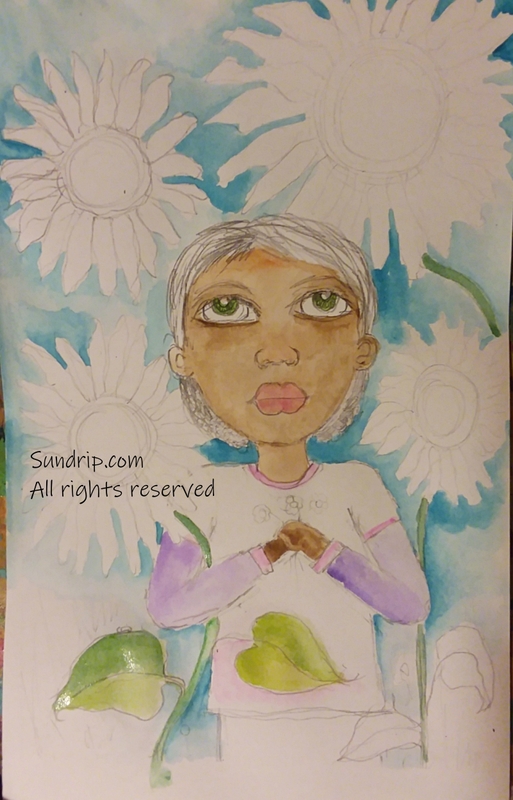 Published on October 27, 2017 October 29, 2017 Categories African-American Rag Doll, Art, Black Children, Children, Creative Writing, Originals, Rag DollTags Crafts, Folk Art, Therapy dollsLeave a comment on You have so much love to give, that’s what makes you special. She looks a lot different from the last post. What a difference a few hours can make. The Little More Girl has more hope and more ways to grow than she ever realized. I think part of my happy clap is the frog green dress she's wearing. I also do a happy clap for pink and purple. Add all three and I'm thrilled to bits. 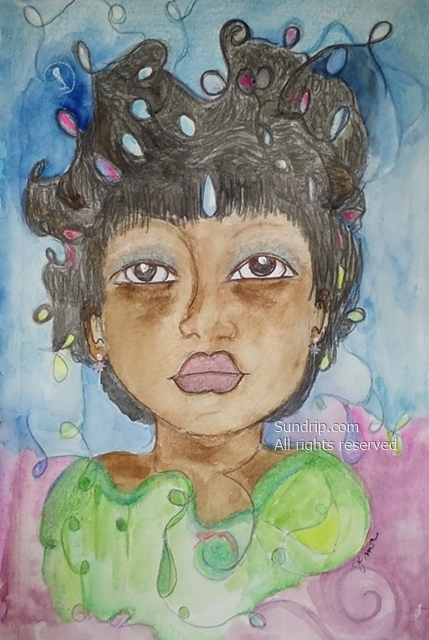 ...continue reading "The Little More Girl"
I tend to work on many pieces at one time, including this little one here. 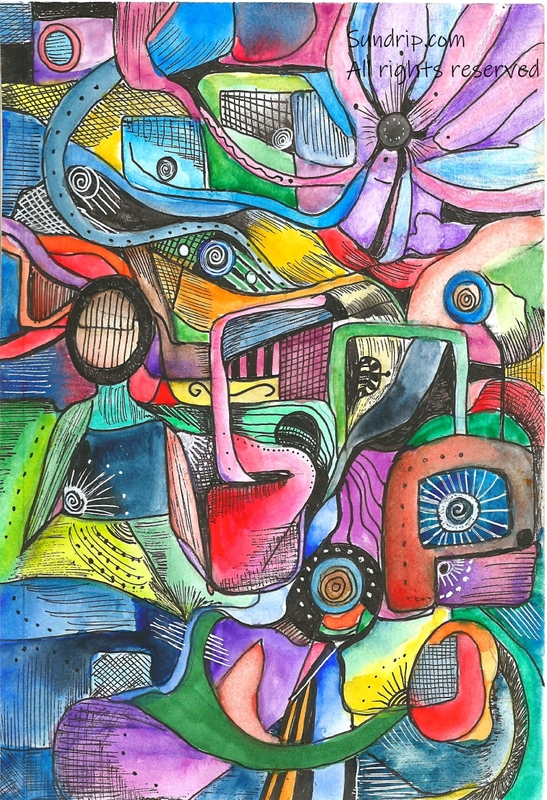 She was created by scribbling loops on the page, erasing in areas then connecting lines to picture this little girl. 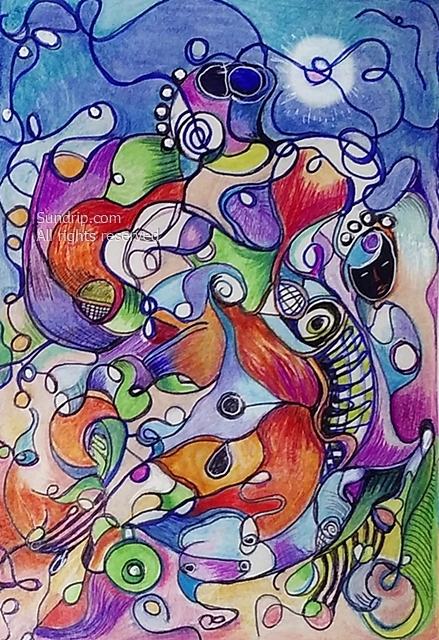 The other drawing in this entry was created by the same process of loops, lines and pearls. She grew up with more than Lupus. She grew up with the ability to imagine and do more than anyone thought she could. 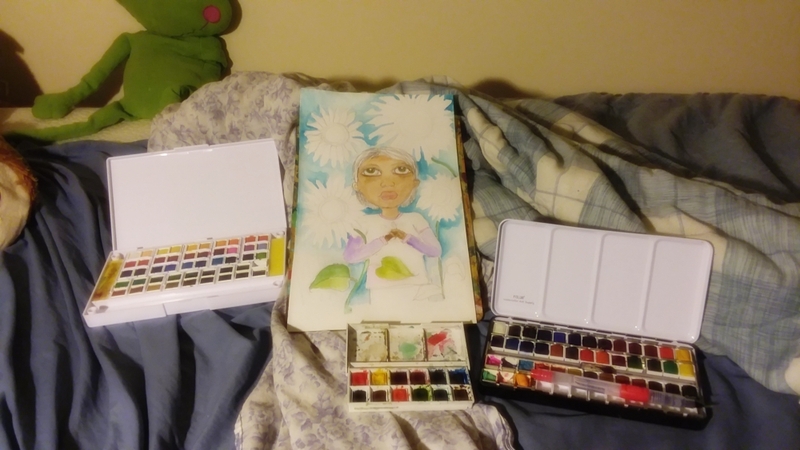 If I became too annoyed with myself concerning my lack of focus and the many half started paintings, I'd be too discouraged to finish anything. I'm going with the flow. I put a few more lines to one drawing then work with another. I add paint to one piece then add the last thing, my signature. I sometimes assembly line work with one color. I lay out 4 or 5 paintings and add the color to each. I let them dry then do the same thing to the next batch. My way of working can be frustrates me. I think I'm not getting anywhere, that is until I put the finishing touches on 5 art pieces in one day. That's when I realize my focus is off a bit and I feel scattered, but I'm still finishing artwork. Recently, finishing art has taken longer but I'm willing to accept that too, especially since I am finishing art. I have four sketch journals I could think of as failed finishes or a head start to the finish line. I choose the latter. Guess what was bartered today? Guess who gets a new home? 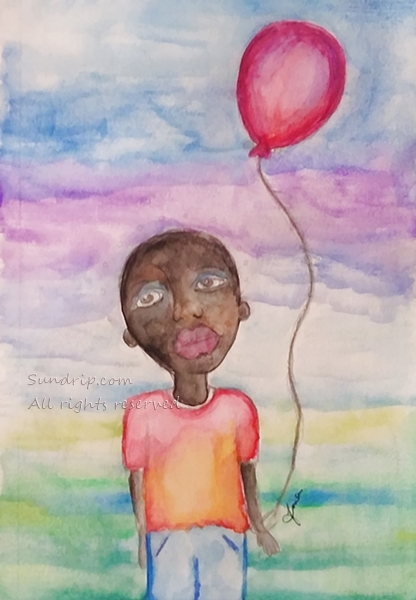 Red Balloon! Good choice. 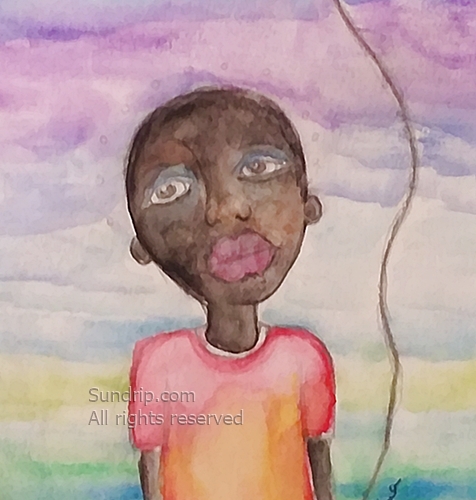 The African American boy with blue accents around his eyes stands tall in front of a rainbow background. There's a faint show of a crown of small, round lights circling young Sam's head. Open the detailed image and look closely, you'll see it. Your light is still there, even if other's can't readily see it. So when it glows only above your head just remember, your light shines to guide you, not others. colors based on what I use most but on the other side I put colors I need more work with. For the most part, I enjoy watercolors but at times I swear it off saying I'll never, ever try this media again. There was a mishap that took place that required damage control. You know those water paint pens? Well, see, no one told me I was supposed to put only water in there. I thought I was to fill the barrel with ink or paint so that's what I did. Later on I saw in blog entries that they were not used that way. I tried to clean them up as well as possible but it didn't turn out so great. I was able to clean and save one barrel but all the brush tops. 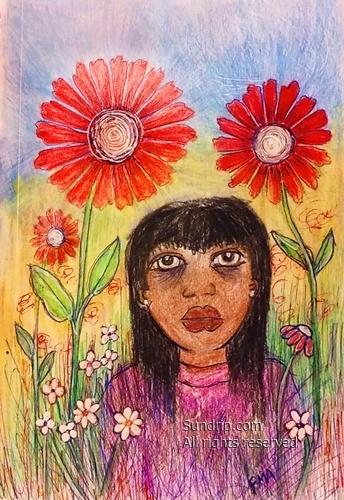 ...continue reading "Sam’s Red Balloon and the Great Pen Incident"
As you know, art without a wall of its own is sad, but today "Jane's Flowers Bloom" was adopted. To celebrate this momentous occasion is the legendary Phil Collins singing, "In the Mail Tonight". Finish: Acrylic seal, signed on the front and back, unmounted. Oh no you can't resist me. Me: Thank you so much Phil for coming to Sundrip to sing that classic song; a song for all time. What do you think Mary Jane, studio cat? Mary Jane: That song chokes me up every time. He kills it on the drums. Amazing job Phil. Thanks for coming. Me: Thanks to everyone who has given original art the only thing it's ever wanted, a wall of its own. Is there wall space in your home? Can you open your heart to grant the wish of original art? 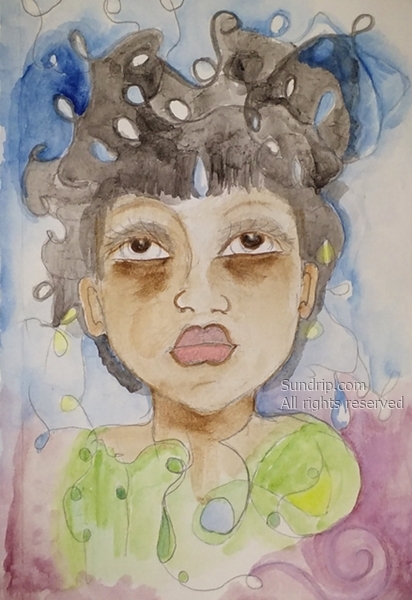 If so, please visit my Available Art galleries as well as my Etsy shop. Contact me and we'll work together to stamp out homeless art. Available Art. Available, too. Etsy shop. PayPalMe. I posted a photo on my FB page about PTSD but later when I visited the page it linked back to, I erased it. There's probably valuable information on the page so I do not fault it for that. I removed the link because of the memes and quotes....and how they landed this hour of the night. In other words, they didn't do anything wrong......it's just hard right now. I'm ranting, anxious, triggered and tired. I completely object to the idea of showing PTSD as pretty, the same way I am disgusted by people showing Lupus in a dreamy way. I assure you, when I'm in pain I don't think about purple butterflies with trailing light. When I'm up this late I don't think about anything other than running from the brain vomit produced by PTSD. I've been up too long, and I'm mad....at everything. I can't get myself to go to bed. It's hot and sticky. My brain won't shut off. Why do I only think to take something for the anxiety when I'm far gone, like this? I hate this world. I've thought recently of just walking away and living quietly in some place...who knows where......just some place. I'm weary, worn out and appalled by the human condition. I'm appalled by the lack of reason, the abundance of openly hating one another and purposeful harm in action and words. It's like there's blatant behavior to inflame and keep communities unsettled. From top to bottom people seem to want nothing more than to upset and destroy each other. It's hard to watch. I want no part of loving anyone....or hating them. ...continue reading "PTSD Isn’t Pretty"